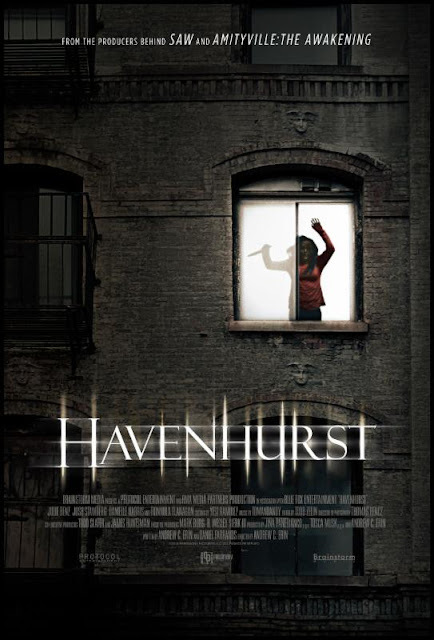 Havenhurst is a Gothic horror set in modern day New York, more specifically an apartment building that shares the film's title. It is directed by Andrew C.Erin who also co-wrote this with Daniel Farrands who I know best for also writing Halloween: The Curse of Michael Myers (not the best entry in the series). Danielle Harris has a bit part here, still on the Halloween trail to me she is best known for portraying young Jaime Lloyd in that series. 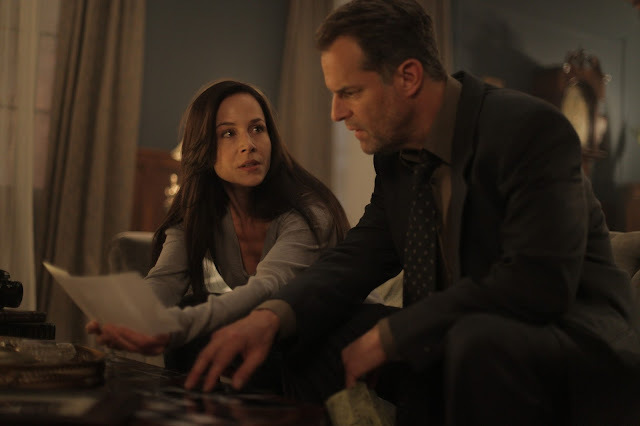 Julie Benz (Angel, Buffy the Vampire Slayer, Dexter) stars as Jackie; a recovering alcoholic who has just left rehab. As part of her programme she is to move into Havenhurst; a gigantic apartment complex that seems to be exclusively for recovering addicts. She is told by the matriarchal owner Eleanor (Fionnula Flanagan) that the rules are simple, stay off her addiction and she can stay forever, break that rule and she will be evicted. However the building has a dark side to it, evicted tenants are dealt with quite harshly, and while they have been forced out their apartment, actually leaving Havenhurst is a different matter entirely. After a strong opening in which we are shown a glimpse of the fate awaiting disposed tenants the film begins proper with Jackie leaving rehab. There is a sense of mystery sustained throughout the movie with the woman investigating what happened to her friend Danielle (who went missing after moving to Havenhurst). To help with this she is aided by cop Tim (Josh Stamberg), though this is just one aspect of the plot. The plot is a big point for me that marred my enjoyment of this. Not due to plot holes, or inconsistencies (though there are some of those), more that at one key part our main heroine does something reckless, stupid and most of all pointless which only seems to exist to set up the second half of the movie. Without her investigation sure this would make sense, but to be getting somewhere without putting herself in danger, and then purposely put herself in danger for no good reason just left me baffled. I couldn't help but feel this was the fault of the writers. The set design for this film is fantastic though. Havenhurst is full of secret doors, trap doors, sliding walls and more. At first I expected a ghost story, yet it soon turns out to be more of a slasher type thing with a madman living between the walls (not really a spoiler). The dark, oppressive, yet large setting echoed The Shining to me, while the many secrets brought to mind Wes Craven's The People Under the Stairs. At times this goes to Saw territory, this was both surprising, and well realised with some really strong scenes of violence and gore, from people getting their fingers sliced off, to a face full of acid, and a still alive severed in half man chained to a bench. These effects were all a lot of fun to see and are complimented with a barely seen but interesting looking huge albino type character. Special mention must go to the stunts involving people being hurled through the air, always looked impressive. The effects for the trap doors were also all neat, and fed into the mystery of it all with Jackie finding bizarre 'spot the difference' photos a previous tenant had taken. The acting is all fine, Benz and Stamberg in particular stood out. Benz came across like a woman living with real demons, frequent nightmares shed light on her dark past which helps you to earn some pity for her. However again going back to the stupid decision midway through the film this pity is lost somewhat, especially in the circumstances it is done in. The overall forward motion of events is paced well enough though I both liked and hated the ending in equal measure, made a change in some respects but another part of it was a little silly. There are some huge plot holes to ignore such as how the other residents never seem to hear the intense screaming and wailing when ever a tenant is 'evicted' despite the walls seeming to be wafer thin. Havenhurst works best due to the set design, less so on the plot development. This is a fun horror that didn't set the world on fire for me, yet as a piece of escapism it did all the right things, disposable, but sometimes that is just enough. Havenhurst was released on 10th February in America where it has gotten a limited theatrical release as well as nationwide Cable VOD and Digital HD releases.